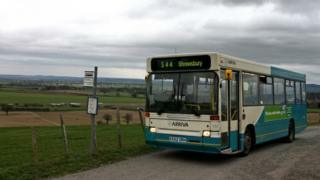 Image caption The 544 service from Lyth Hill to Shrewsbury would be withdrawn under the proposals due to "very low passenger usage"
Routes could be cut, Saturday services lost and journeys reduced in proposed bus service changes in Shropshire. Passengers say the services are a "lifeline" for people and the changes could have a detrimental impact, particularly in rural areas. Fares on Shrewsbury's Park and Ride service could be raised by 40p to £2. Shropshire Council has said it has to cut its public transport budget by £405,000 and has launched a consultation about its plans. The end of Saturday services between Telford and Bridgnorth, Bridgnorth and Kidderminster, Cardington and Shrewsbury and on the Clun Valley Dial a Ride service. 544 Lyth Hill to Shrewsbury withdrawn. Plox Green to Bishops Castle service cut from five to two journeys a day. Bridgnorth Town Centre service cut to hourly from 30 mins. The council is also looking to reduce the budget for Shrewsbury's Park and Ride by £50,000 and is also proposing ending its concessionary fare and group ticket. Simon Harris, cabinet member for public transport said, amid cuts to its funding, the authority needs to find a way to provide "best possible transport service in the years ahead". Katrina Baker, secretary of Telford and Wrekin Bus Users Group said: "These buses are a lifeline for many people, we want to avoid social isolation, we want to keep our communities alive. "All cuts should be avoided, the loss of these services will have a detrimental effect on our communities."